Downright Wool Mattress Pad Comfort and Support - Swatches may be available. Downright's Merino wool reversible mattress pad, made of 100% pure Australian wool, is a most welcome addition to your bed. 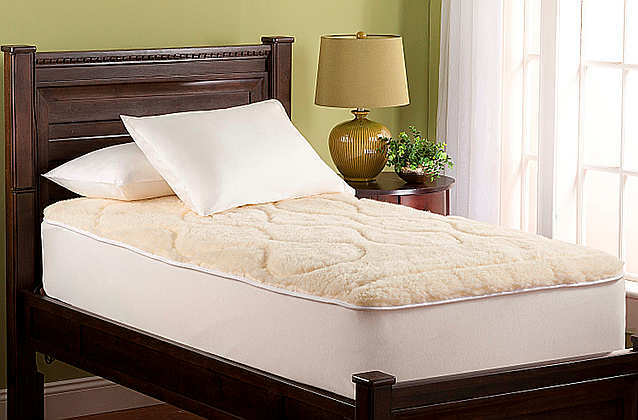 This mattress pad is perfect for all seasons. Wool acts as a natural insulator, keeping you warm and comfortable on those winter nights. and, since wool wicks away moisture, it aids in regulating body temperature, thus keeping you cool in the summer as well. Plus, wool is naturally hypoallergenic and dust/mite resistant. 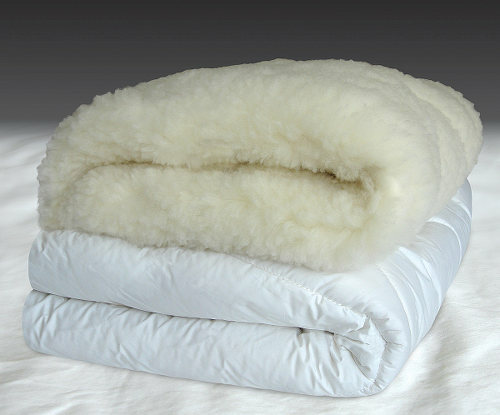 And, unlike most wool mattress pads, this merino wool mattress pad is machine washable too. Downright's new Merino Wool Reversible Mattress Pads add a great layer of protection and natural softness to your bed. This mattress pad is filled with especially enhanced high quality Australian wool. 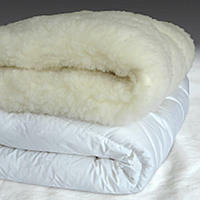 Wool is naturally breathable and regulates body temperature which is essential for a good night's sleep. It reverses from a wool on one side, to a soft cotton on the other side, giving you a perfect choice in both winter and summer. It features a fully elasticized skirt that fits mattresses up to 16" deep to ensure a customized fit. Mattress pad reverses to cotton for those who prefer not to sleep directly on the wool surface. Reversible for winter and summer. These products are not eligible for returns or exchanges. Click on check box to select product, then select choice of color and size to view price. Our swatch program allows you to return samples within 15 days for a full refund. Check box to select this item. Sign up now to receive information about new products, decorating ideas, and sales promotions.